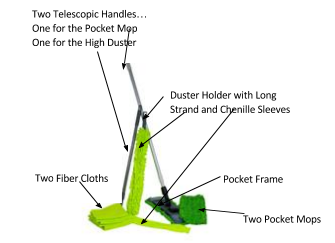 Pocket Mop Frame with Two Pocket Mops and Telescopic Handle. High Duster Kit with Long Strand and Chenille Sleeves and Telescopic Handle. Millions of microfibers act like tiny hooks to lift and hold dust, dirt, grease and spills. Mop is far superior to cotton and sponge mops. More economical than disposable mops. Machine washable. great for both dry and wet mopping. Use it on tile, hardwood, laminate, stone and concrete floors. Superior results, faster with less effort. High Duster is designed for difficult to reach places. Bendable and washable. Includes two heavy-duty Microfiber cloths. Clean your entire house from top to bottom with this complete package.